We are normally a family of walkers, but every once in awhile we get off our feet and change things up. 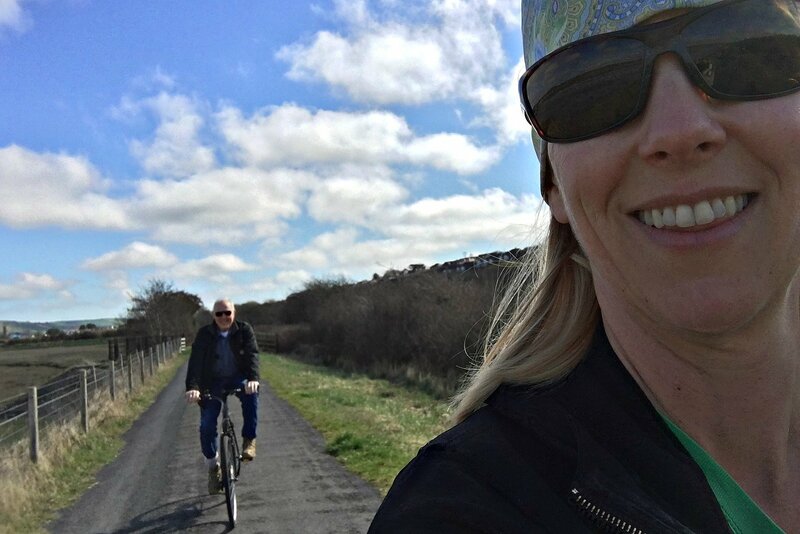 We had so much fun on these two family bike rides in England and Scotland. It has us considering a multi-day adventure later this summer. There are so many places to cycle in the UK. 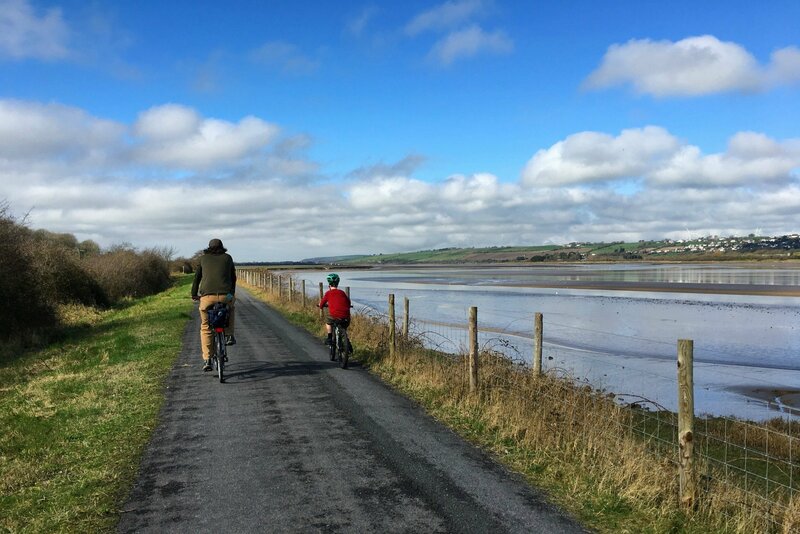 The National Cycle Network is a series of safe, traffic-free paths, and quiet on-road cycling and walking routes that connect to every major town and city. You could get around Great Britain solely on bikes if you wanted to. 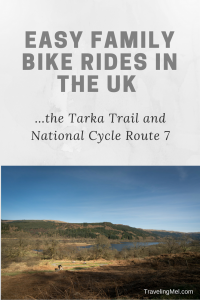 We explored parts of the Tarka Trail and Cycle Route 7—both easy family bike rides in England and Scotland. What makes them easy and family-friendly? They are both (mostly) flat, (mostly) traffic-free, have cafés along the way, and don’t require any driving — leave right from the cycle hire shop. We rode a section of the Tarka Trail when Henry’s dad came out to visit. That means we had riders from eight-years-old to 80-years-old on this ride…and everyone loved it. The Tarka Trail is a series of footpaths and cycle routes that follow the fictional character Tarka the Otter through northern Devonshire. Henry read the book to the kids while we were in Callander, so the bike ride gave them a little more context for where the story took place. We also walked parts of the Tarka Trail in Callander. This is why we travel with kids — family bonding, exploring new places, and putting things into context. Where: (12 miles roundtrip) North Devon, England. The 31- mile section between Brauton and Meeth is a rails-to-trails conversion, car-free, mostly tarmacked, and very flat. How: We started at the train station in Barnstable and rode along the southern side of the Taw Estuary, past historic Fremington Quay to Instow where we had lunch. Cafés: The Fremington Quay Café is in an old railway depot with a lovely deck in Fremington (three miles from Barnstable). There are several restaurants and pubs in Instow. We followed the signs to the Wayfarer Inn and were delighted with our lunch. In fact, there are lots of places to eat along the Traka Trail—you never have to ride more than a few miles without encountering a restaurant or café. Bike Hire: Many places rent bikes near the Tarka Trail. We used Tarka Trail Cycle Hire at the Barnstable train station. It is right on the trail so you never have to ride in traffic. Otter Cycle Hire in Braunton is also adjacent to the trail. Both offer tag-a-long bikes and trailers for little ones. Call ahead to reserve bikes before you go. You can ride a bike through several of the places not to miss along the North Devon Coast. The town we stayed in, Ilfracombe, makes that list. If you are in Dorset, the southern part of the UK, check into the bike route between Portland and Weymouth. The four miles between towns is traffic free the whole way from Victoria Square in Chiswell to Weymouth town centre, with beautiful scenery along the way. And there are so many things to do in Weymouth and Portland. 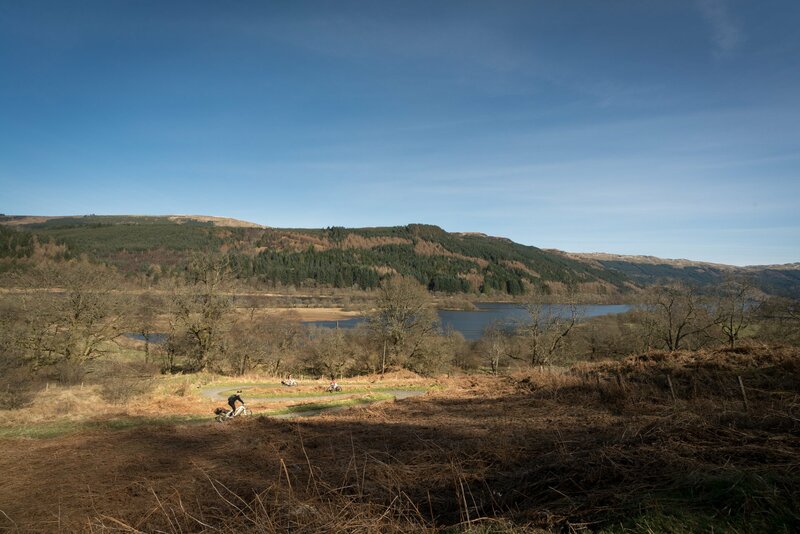 Jazzed by our bike ride in Devon, England, we decided to hire bikes again in Loch Lomand and The Trossachs National Park. We stayed in Callander for a month and Cycle Route 7 passed right through this cute little town. We chose a mostly flat route as we were looking for easy bike rides. Where: (18 miles roundtrip) We rode from Callander to Strathyre, a small part of Cycle Route 7. National Route 7 links Sunderland and Inverness. 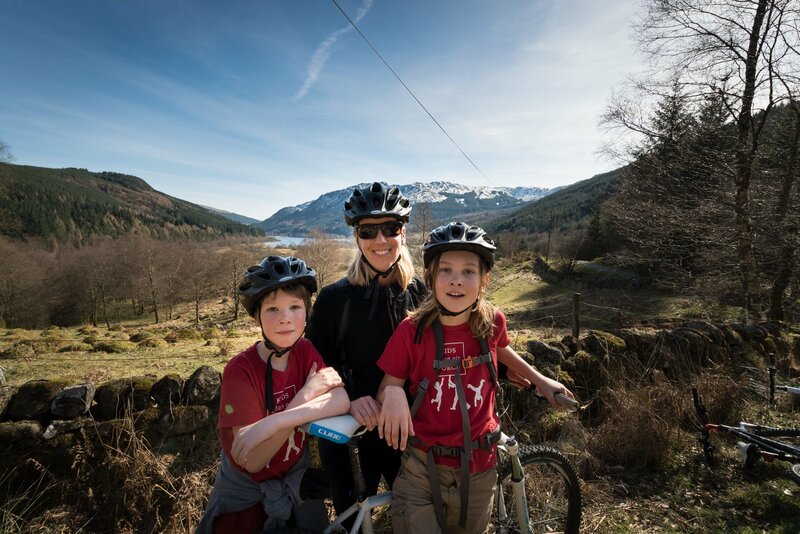 It forms two-thirds of the famous Sea to Sea (C2C) cycle route before heading north to Glasgow via Glen Trool Forest and the Ayrshire coast, before passing through two National Parks – Loch Lomond & The Trossachs and Cairngorms. How: We left right from the cycle hire shop in Callander and hopped onto National Route 7 North. 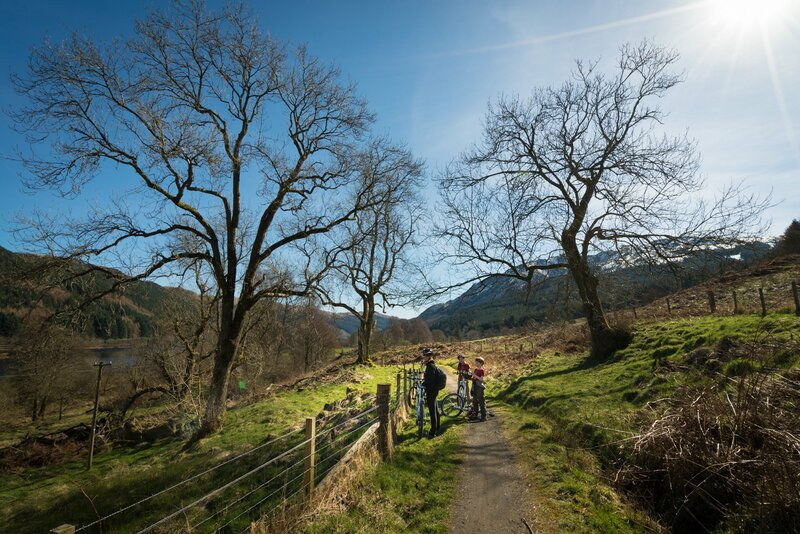 The trail follows the old Oban Railway along the River Leny, passes the delightful Falls of Leny and then through oak woods to Loch Lubnaig. After four miles of flat trail, we climbed a couple hills and one very steep zig-zag section. This part is short and you can just walk the bikes it it is too steep to ride. Then it was all downhill to Strathyre. Cafés: Strathyre has a couple pubs and inns. Make a reservation if you want to visit one of them. We stopped at Broch Café (reservations not needed) for beer and dessert after picnicking along the river. You’ll see it from the bike trail. Bike Hire: We rented bikes for Cycle Route 7 at Wheelology in Callander. Again, I recommend reserving the bikes ahead of time. Another option from Callander is to ride along Loch Vernacher to Brig o’ Turk and the yummy, cute Brig O’ Turk Tea RoomBrig O’ Turk Tea Room. This route follows National Cycle Route 7 South. This article may contain affiliate links. If you make a purchase after clicking on one of these links, I may receive a small commission at no extra cost to you. You will never pay more when buying a product through our link. And we only recommend products that we truly love! Thank you! I appreciate your support! We had a great time riding bikes around! Family bike rides are awesome and it looks like a blast for your family! I would love to go on bike tours as well – it is a great and slow paced to sight-see. Your photos of the sights along your trail are magnificent. I would definitely conquer these trails for those views alone! It’s such a nice, easy way to see a lot of scenery! I live in the South of England and commute by bike. The paths here are not as easy but they are wonderful as well. Last summer I did a 40 miles ride around the Isle of Purbeck and it was wonderful. Very hard but the views were stunning, especially after climbing a hill for what I thought to be forever. That sounds like a wonderful ride! I’d like to explore more areas by bike, so I am going to keep that in mind. I might have to walk up part of the hill, though 😉 . Such a lovely trip! Everyone looks so happy in your pictures. As I live in Denmark, we bike everyday but I normally bike alone. I will arrange biking with friends after this post haha. Biking is nothing new for you! I wish we used it more for transportation, too. I prefer running to cycling and I think the Tarka Trail would be perfect for running too, 12 miles would be enough to tire me out for the next couple of days! Cycle route 7 I think I’d have to cycle as 18 miles is quite far to run, I guess there are more hills in Scotland too. You took some beautiful images, I guess a camera is a must on these routes. I should have mentioned that these are both cycling and walking (running) paths. I prefer walking in hills than on long, flat sections, so the bike is nice for that. I’m definitely normally a walker too — it’s way too hard to bike in Manhattan for me 🙂 But I’m heading to England and Scotland next month, which sounds like the perfect time to pick up a bike again! Thanks for your detailed guide, especially the tips about the stops for the audio guide (though like you, I may be too busy having fun enjoying the sun to stop!). I wouldn’t want to ride a bike in New York, either! One of my favorite things about these trails is the lack of cars! I agree, it is a gorgeous spot! We spent a month here! I think we all decided that we could easily come back. The kids must have really enjoyed the rides, they see more of the world than us adults too. I wouldn’t have appreciated that bike ride to the fullest but the scenery looked very calming and beautiufl. The kids did love it! I think it’s fun to get somewhere so much faster than when we are walking. We knew about superb cycling routes in Amsterdam little did we know that Great Britain such a wonderful cycling route connectivity through major town and city. The scenic vistas along the routes absolute stunners and awe-inspiring. We had no idea we could cycle through inverness definitely on list now. Amsterdam is certainly famous for it’s cycling paths. I’d love to give it a try sometime! Route 7 looks stunning. Cycling is such a great way to enjoy a good sunny day while being close to nature, with a picnic basket. I would love to explore more of Scotland on two wheels! We definitely wanted to take advantage of the sunny days! It does seem like such a perfect sunny day activity to peddle by a lake and have a picnic.